The Mexican rebozo is warm under the cool plastic of my Canadian passport. One is a symbol and tool of the people of Mexico, telling a tale of the mixed heritage of its people, both Spanish and indigenous. The other, my little black book, is my ticket to freedom. The rebozo is worn by women across the country, to decorate and celebrate their womanhood, as well as to carry their burdens, from food, to children, to guns across their backs. The rebozo is an article of womanhood, grace and modesty, as well as a symbol of revolution, identity and strength. I am a traveller. I wander to the whistle of my whims. Focused as a flame without hearth. Since the age of 18 I have worn thin the rubber of my wandering soles in a glutinous lust to explore places and people. Craving experience, craving understanding, craving something. As a Canadian I have been able to indulge this thirst. My little black book with the crest of a foreign Queen, she grants me access with her crown and jowly nod. With its black and white rendition of my features, lips turned down in the regimented sombreness of post 9/11, I can enter almost any nation. Stowed in belt pouches, or knapsacks or contoured to the cup of my bra, it has seen me past countless frowning U.S. Customs officers. It has withstood monsoon down pours and the vile heat of the tropics, always bringing me home to the cool, true north. This little book is one of four I have held since I first ventured beyond borders at the age of 11. They have been inked with stamps from some threescore countries, including Nicaragua, Honduras, Colombia, Peru, Cuba, Turkey, Hungary, Romania, Serbia, Bosnia and Herzegovina, Italy, Bulgaria, Germany, Switzerland, Mexico and Haiti. The majority of countries welcomed me without even the purchase of a visa. This heady freedom is the result of ancestors who hopped on a boat from the British Isles and landed near Boston, U of A, around the time of the May Flower. Eventually the British Loyalists abandoned Uncle Sam moved north to Nova Scotia. Finally my great grandparents made the journey west from one coast the other with the dream of a ranch. I can also give thanks to a Ukrainian grandfather, who was a veritable cad, but nonetheless came to Canada and provided another quarter of my gene pool. Over the handful of centuries that my ancestors have lived in North America, I have no doubt that members of my blood raped and oppressed First Nation people in their quest for a new life. Ever is the way of the conquering populace. All of these lives past conspired to grant me the advantage of being born as a white woman in the second largest country in the world, a country still rich with wild places and with a meagre population, at a time when women vote and live as independent creatures. Because of this, I can travel to most countries with nothing but a pocket full of dough and my little black book. I have friends, both in Canada — on shaky legal standing — and in other countries, who do not hold a Queen’s booklet. Whether for financial reasons or simply due the political standing of their nation of birth, their feet are tethered. 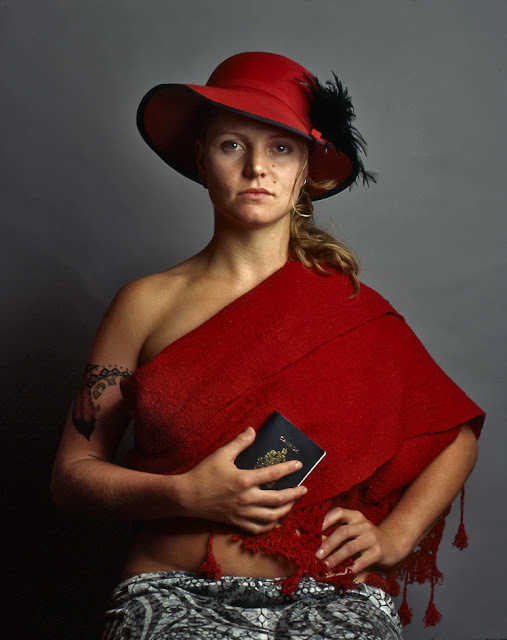 Holding my passport while wearing this red rebozo seems right to me because it reminds me of the obtuse lottery which is life. A lottery of chance, based on politics, war, economics and who is the power of the century. I have many options and I am grateful, yet I also recognize that it is not because I am in any way special. I am no more deserving than those in born under any other flag, be it Mexico, Syria, Colombia, Cuba, Haiti, Bosnia or Iran. When will we respect that people in all countries should experience freedom of movement? Freedom beyond borders. When will we value all lives equally? The cynic in me says never. You want to know which Nation, which people will ride high and wild next round? Here, you can use my dice.